With the exception of hurricanes, most natural disasters will strike with little or no warning. Your family’s chances of surviving the immediate event are exactly the same, whether you have made aftermath survival preparations or not. However, if you do have a rendezvous plan and aftermath survival gear, your family will be in much better condition to survive until relief arrives, services are restored and commerce resumes. Get everyone home. If your home isn’t accessible use a predetermined secondary location. Marshal your resources, retrieve your survival gear and know what you have. Stay alert to further natural threats and avoid dangers like downed power lines, broken gas lines or other event-caused hazards. Be wary of strangers and be helpful to friends without endangering your own survivability. Decide how to proceed and act upon your decision. Natural disasters can be and often are devastating to an entire local area, while leaving surrounding regions with less severe, only minor or no damage at all. If you are forced to transit from your destroyed home to a less afflicted area, you will need mobility survival kits, (see below), and other mobility survival gear. Manmade disasters develop over a period of months or years, and progress along historically predictable pathways. Anyone with even a basic knowledge of history and the ability to glean the kernels of truth buried deep within biased, agenda driven “news” reports, will be able to see manmade disasters coming. You have historical perspective, the ability to read between the lines and the intelligence to plan for survival through what might be a long, dangerous and reformative manmade aftermath. Before you can make your plan, you must decide where you’re going to make your stand. Your decision must be based upon the conclusions you reach after conducting a clear-headed, in-depth assessment of the defensible sustainability of your primary residence and/or any optional fallback redoubt. Is the physical site on high ground with dominant and clear lines of sight/fields of fire extending to all approaches? Is the building visible from nearby roads and if so, can it be made to appear poor and uninviting? Is there vegetation too dense for you to see into, which attackers could use to approach unseen? Are the roof and siding made of fireproof materials such as metal, tile, slate or a modern fire resistant composite? Are the outside walls impenetrable to small arms fire, (Brick, stucco over concrete block etc. ), or can an interior secure room and firing positions be armored, by installing steel plate? Can the windows be covered with bullet resistant steel shutters with horizontal/vertical firing slits and are the areas to the sides and below the windows lined with steel? Is there a secure storage room(s) such as a basement or attached garage for warehousing bulk foods and other survival gear? Is the water wellhead located INSIDE the building or is there a rainwater cistern or tanks and installed or available water purification equipment? Are there solar panels and/or a diesel generator with a large capacity underground (#2 heating oil) tank? Is there acreage available and suitable for planting a Survival Garden? Is there running water for laundry, crop irrigation and stock watering? Are there enough trees to supply firewood for heat and cooking? Are there neighbors with whom you can form mutual aid and defense alliances? Are there neighbors against whom you think/know you will be forced to defend? Is there a hidden exit leading to a well-disguised escape route which can be used as a last resort? There will be many more items to consider but in the end it will be your decision alone and only time will tell if you were right or wrong. 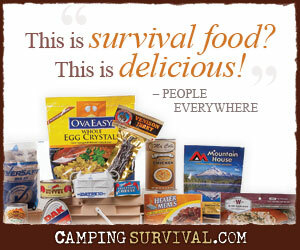 This is survival and there are no guarantees.